Step back into the past and see and feel the times from 200 years ago and more. Engaging guides make this a most enjoyable half-day trip. 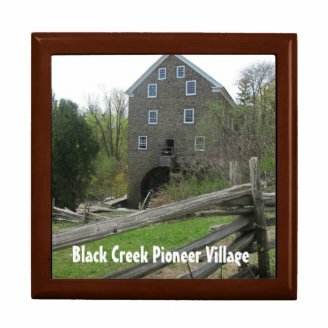 Having grown up in Toronto, I remember when Black Creek Pioneer Village was way out of the city. By now, the city has grown up around it, which only makes it that much easier to take this trip back in time. Public transportation and ample parking space make it easily accessible. Walk on dirt roads, explore actual homes and buildings from the 1800s, and talk with the guides placed in each building, who are more than happy to share with you what they know about life in those early days of Toronto and Canada. Then, if you want to take back a souvenir, you can buy a product actually handmade on the site, such as a woven table runner or a tin lantern. It's great fun for kids and adults, but to tell you the truth - I enjoyed it now more as an adult than I did as a kid. I was visiting with my daughter who is studying at York University. Imagine my surprise when I discovered that Pioneer Village is actually on the university grounds! So I invited my daughter to join me for a few hours to wander around, seeing life as it was in Canada 200 years ago. There is path through campus from the area where the TTC (city bus services) leaves you off at campus called "Campus Walk". You can take this path all the way to the edge of the university grounds, past the tennis courts and in front of you, you will see the parking lot. It is about a 15-minute walk for a moderately fast walker. You can use the map below to find your way there - just make the map larger to see the actual paths on the university campus or smaller to see where it is with respect to the entire city. Click: more information on getting to Black Creek . We were there on a Monday morning - the only other people there aside from us were a few couples and three classes of school children. It was ideal. We arrived at about 10 am and the guides in the various positions were still energetic and happy to answer questions and tell stories. Without their explanations, the visit would have been a lot less meaningful. It is likely that weekends and summers are more crowded and so it is possible you will get less than the one-on-one attention that we received. John, originally from Scotland, has been working as a tinsmith in pioneer village for the past 25 years or so. He is a real character and my daughter and I were very happy to have met him and have had the opportunity to enjoy his stories and his sense of humor. He showed us - and then the elementary school class that soon joined us - how he makes lanterns and small vessels from tin. 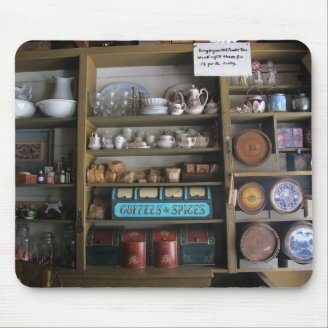 John told us how the women in the 1800s were essentially supposed to work in the home and raise the children and they were not really supposed to be in workshops, but to buy whatever they needed from the general store. However, they knew that if they ordered a lamp directly from the tinsmith they would get it cheaper because they wouldn't have to pay the general store mark-up. So they would send their daughters to the tinsmith and the daughter would tell him what mother wanted. The tinsmith would ask about the size and other particulars and then ask how mother intended to pay. Since only the rich had money, they would pay in bushels of produce, for example. The tinsmith would mark the amount down in his ledger and if what she ordered was worth less than what she could pay, she would be left with a credit toward the next order, and if it was less, she would owe him and pay when she could. When I asked how long it would take to fulfill an order, John laughed and said that people did not ask such a question back then. It took as long as it took. The daughter might pop into the shop and ask if the order was ready and either it was or it was not. These were only some of the stories we heard from John. He is happy to answer any and all questions and will amaze you with his knowledge of the times. Tin lamps and candle holders made by John (and perhaps other tinsmiths as well) are sold in the gift shop. A stairwell at the side of the tinsmith shop leads up to the Black Creek Masonic Lodge. This building actually is one of the oldest in Pioneer Village (1840s) and, like many other structures, was originally built in Woodbridge, about 10 km north-west of here. The modern version of Masonic lodges began in the 1700s in Britain and Europe, as men of upstanding character over the age of 21, believing in a Supreme Being regardless of their religious affiliations, would meet to promote morality and virtue in their communities. 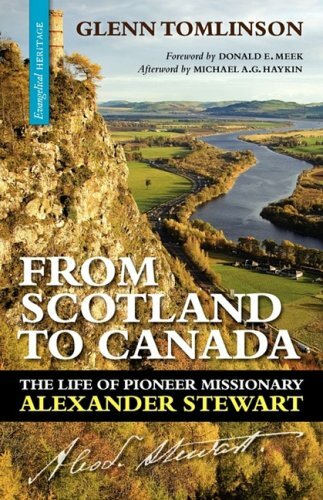 Volunteers from lodges in the region donate their time to provide information about Freemasonry and its history in Canada. We particularly enjoyed our discussion with Gord, who happily answered all our questions. Nairi, who worked part time at Pioneer Village while studying history at York University, stayed on full-time after completion of her studies. She explained that, while she is acting as village weaver, in actual fact, women did not work outside the home in those by-gone days. Nairi showed us how the loom is set up, with a foot-pedal to operate sets of strings according to the design she prepared, and how she makes the weave. It looked like painstaking, eye-straining, work. Since Nairi does the weaving herself, she can answer all your questions about it. Some weaving products are available for purchase at the gift shop. Here we learned how the oven temperature was ascertained in pioneer days when thermometers were not available: the woman inserted her arm into the oven and counted. The number she was able to reach before the heat forced her to remove her valued limb, told her whether or not it was the right temperature for cookies, bread, etc. or how many loaves of bread she could bake at one time. It must have been a real art, because not only would the right temperature need to be achieved at the start of the baking, but also maintained steady throughout. The huge waterwhe el outside this building moves two separate pieces of equipment: one that crushes the grain into flour and the other that operates a line that lifts the flour onto the threshing floor above for separation into flour and bran. You can also go downstairs to see the huge gears and hear them groaning as they turn. Blythe, a theatre student who stayed to work full-time at Pioneer Village after having completed her studies (she is still auditioning for parts as well), explained the life of the priest's family in the home across from the church. I have not shown you the school, the church, the doctor's residence and office (by the way, in the 1800s, they did not sterilize their equipment nor wash their hands between patients - and the wife would see patients if the doctor was off delivering a baby or otherwise busy out of the office! ), the photography studio, the animal barn, the general store, and much more! 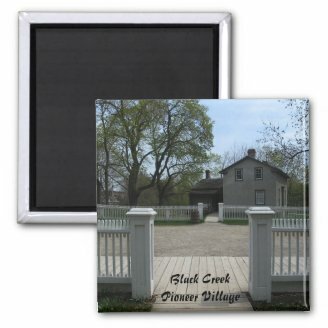 You might want to consult the Black Creek Pioneer Village website for more information. 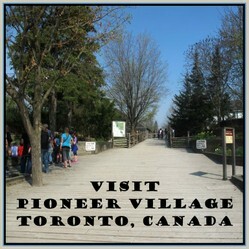 Are you familiar with Pioneer Village? I have been to a similar site elsewhere. I have never been to such a site and you make it sound worth a visit. I have never been to such a site, and reading about it is enough for me. Hope you enjoyed this little trip we took together. I often think how much the world has progressed in the past two centuries. Being who and how I am now, I couldn't see myself living in the past. Maybe 20 years ago, but not farther back :). Okay, maybe the 1960s and 1970s would be okay too :) . . .
Want to take a break from the bustle of downtown Toronto without leaving downtown? Here is an easy walk for singles, couples and families who want to see a quiet side of the city. Often associated with GMC & vehicle manufacturing, Oshawa, Ontario sometimes gets an undeserved rep . But this little gem of a city, has some treats for the adventurous traveler!